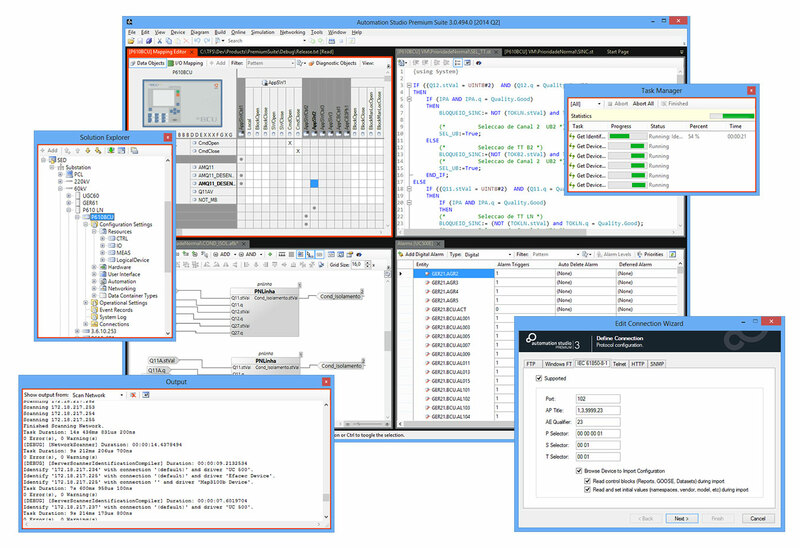 Automation Studio 3 is an “all-in-one” easy-to-use software that provides an open, productive and flexible engineering environment for the automation engineer or system integrator. It is the only required tool for Efacec automation products ranging from controllers and relays to gateway and HMI products. It has been designed for the engineer working on simple one-man projects or for multiple distributed control system projects where cooperative teamwork is required. All engineering activities from design, configuration and programming, through validation, testing and commissioning up to operation and maintenance are supported by the toolset, hence providing a single environment for all engineering roles during the entire system life-cycle. It is based on modern engineering tool paradigms such as unified project system, single-click deployment, reconfigurable window layouts, copy/paste and drag/drop, wizards or visual designers. Built for standardization and reuse through libraries, objects and templates, significant time savings are obtained by reducing configuration workload as well as testing and rework through improved quality output. Extensively based on open standards such as IEC 61131-3, IEC 61850, COMTRADE or FTP, Automation Studio is an open tool that allows end-users to benefit from multi-vendor system integration without compromising engineering efficiency. Automation Studio is ready for Ed. 2 of IEC 61850 and provides unprecedented support for both system and device configuration role as well as the multiple standard configuration workflows.